Expectations: I didn't have every high expectations for my first Bear Flavored Ale — capturing the flavor and essence of bears is notoriously difficult. #1 didn't turn out terrible, in the general scheme of things, but it's so far removed from what I was expecting that I am definitely a bit frustrated with it. Basically, this beer is just too sweet. There are so many things that could have affected the outcome, given my limited knowledge at the time of brewing, that I'm already done worrying about it. The recipe was never meant to be very hoppy to begin with, so if, say, I ended up with a stuck fermentation resulting in a too-sweet end product, the hops weren't going to do anything to balance that out. Slightly more oddly, the beer came out very bready, kind of thick with a definite yeast flavor. 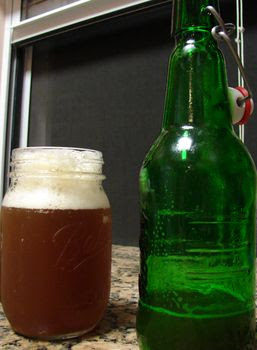 My first two recipes came with dry yeast, which most homebrewers recommend avoiding in favor of good liquid yeast— so partially, it could be that I wasn't using great yeast either. Taste: If I told you that this was some kind of sweet light brown ale or something, you might not be disappointed. It's not terrible, and some bottles have hit me better than others, but the sweet maltiness is just a bit overboard for my tastes, and that yeasty, bready flavor is never going to seem right to me. I can't say that I've ever had a commercial beer with a similar profile, so something definitely went awry along the way. Hopefully I'll be able to avoid it in the future. Expectations: If you understand what IBU's mean, you'll already realize what I wish I would have known before I brewed from this recipe. 43 IBUs isn't very hoppy for an American IPA — and with the malty grain bill, this one is definitely more in line with traditional British varients. Unsurprisingly, this came out tasting more like what I expected from my pale ale — except it's still got some distinct yeasty / bready flavor that I can't quite pinpoint. I think it's partly the grains, partly the yeast, and partly the methods I used during the brewing process. Still — you can at least taste the hops in this one, and while it's much darker and maltier than I would like, it's serviceable. Taste: There's that something about the flavor profile in this IPA and pale ale that I'm not a fan of. It's not bad, but it has something going on that's just off. It's definitely a larger issue than not using enough hops — though in addition, there are not enough hops, so. On the plus side, it's still beer, I don't mind drinking it, and I learned a lot from this one. Expectations: For this beer, I finally strayed from a basic recipe kit and set off into Adventureland, so I had high hopes. Unsurprisingly, and reassuringly, I think this is by far the best beer of the three. It tastes like a hefeweizen. Whew. There's none of that bready, yeasty flavor that overtook my first two. Of course, few things are ever perfect, and I'm haunted here by one glaring flaw. For some reason, this beer didn't carbonate properly, and most of the bottles I've had so far have been kind-of flat. Sigh. Taste: I really am shocked at how much this came out tasting like what I wanted. The peach is on the subtle end of things, but you can actually notice it if you know it's there. Instead of an overpowering, sweet flavor, it contributes more of a general fruitiness and a slightly tart, slightly sour profile that I think goes well with the wheat base. Everything together is fairly subtle, with the effect that this tastes like your basic hefeweizen, except not quite. I really came so close here, but I can't quite be satisfied since — and I'm not quite sure how — the priming sugar hasn't quite done its stuff. After two weeks of conditioning, this is still coming out with very little head, and mostly flat. Fortunately this doesn't affect the taste very much, but it does reduce the enjoyability of the beer — and it's annoying. I have no idea why wouldn't have carbonated properly, since I added the usual amount of priming sugar, but wheat beers are generally pretty high in carbonation, so it's sad to see this one so lacking. Hopefully a few more weeks of conditioning will help a bit. Keeper: Most likely I will keep this recipe around to play with in the future, although it has a few things working against it. For one, peach puree is really goddam expensive, apparently. It cost almost as much for the peach as it did for the rest of the beer. While I am enjoying this, I'm not enjoying it significantly more than I would a standard hefe (and I'm honestly kind of getting sick of wheat beers entirely), so it'll likely be a long time before I'd consider revisiting this recipe. That second beer looks like gravy. Like a brown gravy in need of some potatoes to bathe in lovely gravy bits.